NEW YORK -- Americans protesting corporate greed and inequality faced down authorities in parks and plazas across the country ahead of what organizers describe as 24 hours of public action planned for Saturday in cities around the world. Groups spanning the globe from Asia to Europe  and in every U.S. state  announced demonstrations and other actions. The rapidly growing movement could link a protest that started in New York's financial district together with longer-standing anti-austerity demonstrations that have raged across Europe amid a roiling economic crisis. 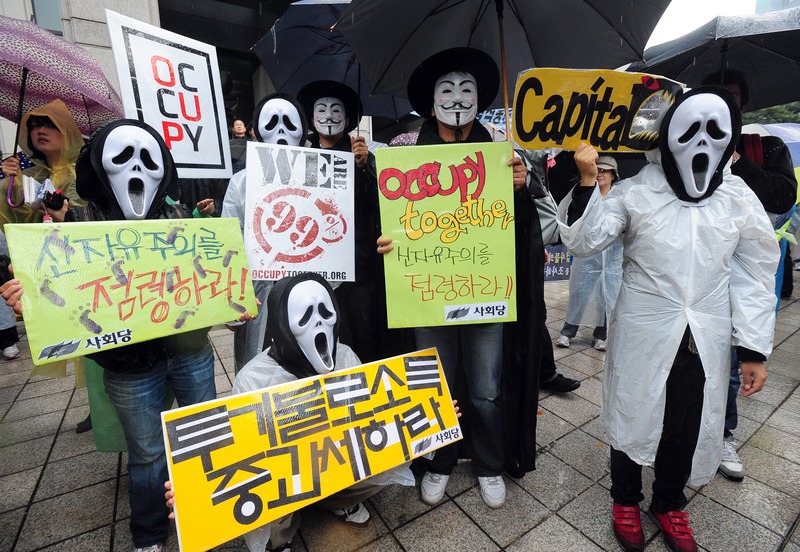 Does "Occupy" movement need to get specific? A call for mass protests on Saturday originated a month ago from a meeting in Spain, where mostly young and unemployed people angry at the country's handling of the economic crisis have been demonstrating for months. It was reposted on the Occupy Wall Street website and has been further amplified through social media. Jesse LaGreca, a leader of Occupy Wall Street, said on "The Early Show on Saturday Morning" the spread of the protests around the world "speaks to the amount of resolve people have. We are seeing our future stolen away from us while the wealthiest one percent get richer and richer, and I'm glad people are taking a role and participating in their democracy." The growth is "happening very organically," he says. "There is communication (among protesters worldwide) through Twitter, through Facebook, through social media and facebook, though social media, and just through friends who are concerned about each other. But the organic nature of this movement just can't be denied." In Sydney, Australia, around 300 people gathered Saturday, cheering a speaker who shouted, "We're sick of corporate greed! Big banks, big corporate power standing over us and taking away our rights!" At the Sydney rally, Danny Lim, a 67 year old immigrant from Malaysia, said he moved to Australia 48 years ago in search of opportunities. Now he no longer trusts the government to look after his best interests. He thinks Australia's government has become too dependent upon the US for direction. "The big man  they don't care. They screw everyone. Eventually we'll mortgage our children away," Lim said. In Tokyo, where the ongoing nuclear crisis dominates public concerns, about 200 people joined the global protests Saturday. Under the light drizzle, the participants marched outside the Tokyo Electric Power Co., which operates the tsunami-hit Fukushima Dai-ichi nuclear plant, chanting anti-nuclear slogans, while opposing the U.S.-led Trans-Pacific Partnership free trade bloc that Japan is considering joining. "No to nuclear power, no TPP," the marchers chanted as they held up banners. In Manila, about 100 members of various groups under the Philippine left-wing alliance, Bayan, marched on the U.S. Embassy Saturday morning to express support for the Occupy Wall Street protests in the United States and to denounce "U.S. imperialism" and U.S.-led wars and aggression. They carried a large banner that said, "Resist imperialist plunder, state repression and wars of aggression," and another expressing "Solidarity action for Occupy Wall Street." They also chanted "US troops, out now!" in reference to the presence of hundreds of U.S. soldiers, mostly in the southern Philippines, involved in anti-terrorism training of Filipino troops. One man carried a placard saying "Genuine people's democracy lives in the streets." South Korean activists have pledged to bring 1,000 people into the capital's Yoeuido financial district and in front of Seoul City Hall to protest inequality. Rome is girding for major protests Saturday by demonstrators known as the "indignati." As Premier Silvio Berlusconi survived a no-confidence vote in Parliament, protesters outside shouted "Shame!" and hurled eggs toward the legislative building. Italian TV reports from Milan showed about 20 young people trying unsuccessfully to enter a building where Goldman Sachs has an office, and spraying red paint on the entrance. Protesters in London vowed to occupy the London Stock Exchange on Saturday. "Social network sites are suggesting somewhere in the vicinity of 10,000" demonstrators could hit the streets in that city, CBS News Correspondent Charlie D'agata reported on "The Early Show on Saturday Morning." "If they do show up," D'Agata said, "it would make it one of the largest gatherings in this global protest," D'Agata continued. Nights of rioting rocked the British capital in August after the fatal police shooting of a 29-year-old man. In Canada, protests were planned for Saturday in cities including Montreal and Vancouver. In Toronto, demonstrators plan to gather at Canada's main stock exchange. Prime Minister Stephen Harper said he doubted Canadians would be as angry as their neighbors to the south as Canadian banks have not received a U.S.-type bailout. He declined to comment when asked if he was concerned about a possible repeat of street violence that Toronto experienced at the G-20 summit last year.In the United States, politicians in both President Barack Obama's Democratic Party and the opposition Republican Party struggled to come up with a response to the growing nationwide movement. Democrats have been largely supportive but also wary of endorsing criticism of Obama's rescue of big banks in the aftermath of the 2008 financial crisis. The bank bailout was launched in the last months of President George W. Bush's administration. On Friday, demonstrators from San Francisco to New York resisted police, with some forming human chains and heckling corporate leaders. Hundreds have been arrested on minor charges in cities across the U.S. since the protests started about a month ago. Protesters at the heart of the "Occupy Wall Street" movement in New York exulted Friday after beating back a plan they said was intended to clear them from the privately owned park where they have slept, eaten and protested for the past month. They said their victory will embolden the movement across the U.S. and beyond. "We are going to piggy-back off the success of today, and it's going to be bigger than we ever imagined," said protester Daniel Zetah. The owners of Zuccotti Park in lower Manhattan had announced plans to temporarily evict the hundreds of protesters before dawn Friday so that the grounds could be power-washed and inspected. But protesters feared it was a pretext to break up the demonstration and swelled their ranks by several thousand, recruiting through Facebook, Twitter and word-of-mouth. Minutes before the appointed hour, the word came down that the park's owners, Brookfield Office Properties, had postponed the cleanup. Brookfield, whose board includes New York City Mayor Michael Bloomberg's girlfriend, said in a statement that it had decided to delay the cleaning "for a short period of time" at the request of "a number of local political leaders." As protesters celebrated, about 15 people in a breakaway group were arrested nearby in a clash with police. A legal observer marching with the group refused to move off the street for police and was run over by an officer's scooter. He fell to the ground screaming and writhing and kicked over the scooter to free his foot before police flipped him over and arrested him. And a video posted online showed a police officer punching a protester in the side of the head on a crowded street. Police said the altercation occurred after the man tried to elbow the officer in the face and other people in the crowd jumped on the officer, who was sprayed with a liquid coming from the man's direction. Police said the man, who escaped and is wanted for attempted assault on an officer, later said in an online interview he's HIV positive and the officer should be tested medically. A man who identified himself as the protester, Felix Rivera-Pitre, said in a statement posted online that he didn't provoke the officer. "I was just doing what everyone else was doing in the march," he said. "It felt like he was taking his frustrations out on me." In San Francisco, protesters from the Occupy Wall Street movement heckled News Corp. CEO Rupert Murdoch during a speech at an education forum, accusing the media mogul of trying to profit from public education. "Corporations own all the media in the world. Why should they not own all the education as well?" an activist who identified himself as Joe Hill yelled sarcastically. "It's OK, a little controversy makes everything more interesting," he said to audience applause before continuing his speech. In Denver, dozens of police in riot gear herded protesters away from the Colorado state Capitol grounds, dragging some and arresting about two dozen as they dismantled the encampment the protesters have held for three weeks. In Trenton, the New Jersey state capital, protesters were ordered to remove tents near a war memorial. Organizers in Des Moines, Iowa, accepted an offer Friday night from the mayor to move from the state Capitol where they were prohibited from staying overnight to a city park blocks away, averting a possible showdown. San Diego police used pepper spray to break up a human chain formed by anti-Wall Street demonstrators at a downtown plaza where they have camped for a week. In Philadelphia, protester Matt Monk, a freelance writer, was elated by the news out of New York. "That means at the very least, the powers-that-be, wherever they are, know that they have to contend with us in a less heavy-handed way," he said. Republicans at first criticized the demonstrations but have shifted their tone in recent days. House Majority Leader Eric Cantor warned of "growing mobs" but later said the protesters were "justifiably frustrated." In Tuesday's Republican presidential debate, former House Speaker Newt Gingrich referred to the protesters as "left-wing agitators." U.S. Secretary of State Hillary Rodham Clinton made a reference to the New York protest in a speech at The Economic Club of New York. "The protests happening just a few miles from here ought to be a reminder to all of us that we have a great deal of work to do to live up to the expectations of the American people," she said Friday. And a group of 100 authors including Salman Rushdie, Neil Gaiman and Pulitzer Prize-winning novelists Jennifer Egan and Michael Cunningham signed an online petition declaring their support for "Occupy Wall Street and the Occupy Movement around the world."